Let's have a look at how you can create the best Disney Princess Tiana bedroom ever - Princess Tiana is from The Princess and the Frog and this bedroom is going to be absolutely perfect for any little girl who dreams of kissing frogs! This sassy Princess isn’t sitting around waiting for her Prince to come, but she is winning admirers around the world. Princess Tiana is a strong princess who is determined to overcome any obstacle that’s put in her way. 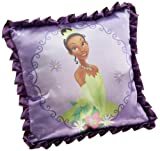 If a little girl you know is one of Princess Tiana’s new loyal subjects then she would absolutely adore having her own Princess Tiana decorated bedroom. Designing any Disney Princess bedroom can be done to the smallest detail, incorporating the right color paint and/or wallpaper and totally redoing the room. It can also be done by simply adding a couple of posters and a comforter on the bed. Once you’ve decided on how far you want to take the Princess Tiana theme then you can start shopping…..this is my favorite part of redecorating! When my daughter was first born we were living in rented accommodation so all that I could do was hang up a couple of posters and used bedding to individualize her room. Luckily we’re now living in our own home, but I still believe that posters are an important part of individualizing a room. I brought a couple of silver poster sized frames when my daughter was born and I popped Pooh posters in them initially and they have gradually been changed over the years, now home to the Black Eye Peas! You can buy some great Princess and the Frog posters featuring the beautiful Princess Tiana which would look absolutely fantastic on any little girl’s bedroom wall....in a frame or not. If posters aren’t the type of thing you want hanging up in your daughter’s bedroom, then you can always recreate the same magic by using limited edition art. 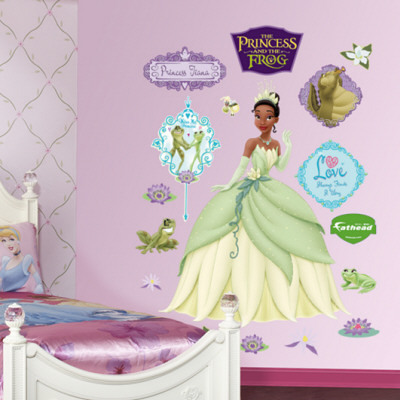 Another way of adding a touch of Princess Tiana magic is by using wall decals which are becoming more and more popular all the time with parents as they are easy to remove from the walls if your child decides that she has a new favorite character. The next thing you need to complete a Princess and the Frog bedroom is some bedding. I believe that buying your child a plain white bed is going to be a great investment as while they grow and go through different stages from Dora the Explorer to the Jonas Brothers you can keep their bed up to date with their choices. 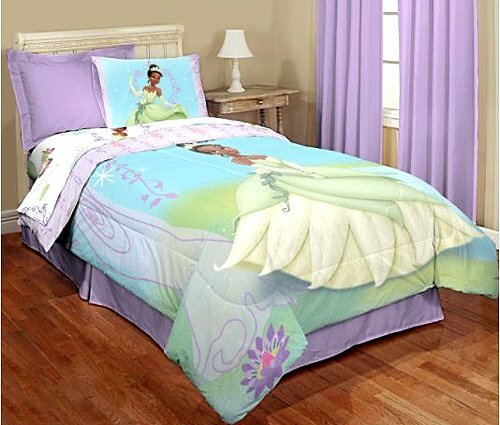 You can purchase your own Princess Tiana sheet set and comforter from Amazon (is there anything you can’t buy from this fabulous online store???) I also believe that the bed would not be complete without a plush frog. After all the movie is Princess and the Frog after all so why not give your princess her own frog? Twin sheet set 60-Inch cotton 40-Inch polyester, printed princess and the frog. Twin Comforter 60-Inch cotton 40-Inch polyester printed princess and the frog. Watch your little princess light-up as she imagines herself a Princess for a day with this Princess and the Frog Twin/Full Washable light-Up Comforter! If you want to give your daughter's bedroom the complete royal treatment then you'll want sheets and a comforter and this next set contains both of them which is a great way to go. Included in this set is one twin size comforter, one twin flat sheet, one twin fitted sheet as well as a standard pillow. I think that having a photo frame and snow globe also helps to add to the Princess and the Frog magic that you’re trying to encompass in this special room. If you have room for a standup in the corner of the room then it would be like popping icing on a cupcake – just completing perfection! Of course if the room isn’t big enough then leave the standup alone (or buy one for room decoration if you’re planning a Princess Tiana birthday party for your special princess). 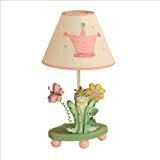 Of course every bedroom needs a bedside lamp as well and you can actually get a princess frog lamp that is absolutely gorgeous. Disney Princess Jewelry Boxes are not only a great gift idea, but are also a fantastic bedroom accessory when dressing up a Disney Princess bedroom. Imagine combining the magic of snow globes with the fantasy of the Disney Princesses. Well imagine no more because I have a collection of Disney Princess Snow Globes here for you to peruse. Disney Princess Nesting Dolls are a great combination for any little princess to own however. As a toy and a bedroom ornament any one of these Disney Princess nesting dolls are sure to be a hit. I love Tiana and the Princess and the Frog movie. These will make a little girls bedroom so cheery and fun. Great ideas.